Nominations are now being accepted for SC Women in Business. This is an annual event to celebrate women across South Carolina in different industries across our state. The categories include: Energy, Finance, Health Care, Real Estate, Professional Services, Law, Hospitality, Non-profit/Government, Manufacturing, Construction, Technology, Education and Women to Watch. 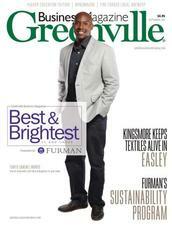 Each September Greenville Business Magazine along with Furman University honors outstanding young leaders for their professional and community contributions. Nominate a deserving young profession today! Nominations are now being accepted for 50 most Influential. If you have a person you think we should consider on the list this year for the economic impact they have had in our community let us know. Our editorial staff will review all nominations. The South Carolina CIO Awards presented by Greenville Business Magazine, Columbia Business Monthly and Charleston Business Magazine with AcumenIT will recognize South Carolina-based CIOs, CISOs, and IT Directors who lead their organizations in delivering business value and innovative use of IT. South Carolina's Fastest Growing Companies competition is the Annual ranking of the Palmetto State's 25 most dynamic and successful companies. This event is presented by The Capital Corporation and Co-sponsored by Integrated Media Publishing (publisher of Greenville Business Magazine,Columbia Business Monthly and Charleston Business Magazine), BDO USA, LLP, KeenanSuggs/HUB and PNC Bank. The event recognizes an exceptional and diverse assembly of businesses from across the state among its Top 25 winners. Now in its 17th year, this competition recognizes the achievements of top-performing private and publicly-owned companies that have contributed to South Carolina's economy through exceptional increases in revenues and employment. This established and well-respected list provides the winning companies with increased media attention, new business prospects and networking opportunities with other "best of breed" companies in the state. Shout out, stand out: Encourage workplace pride. If you work at a great company, give colleagues a morale boost with something to celebrate. And give your employer well-served credit for creating something special. Boost recruiting: Attract and retain the best talent. Employees want to work at companies recognized as leaders that operate by a strong set of values. Raise the business profile: The Top Workplaces logo on company materials and websites helps spread the word about successful work environments. Customers and business partners will take notice. That awareness can help create new business opportunities, too. 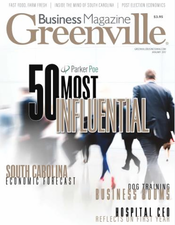 Earn public recognition: Achievements are recognized by Greenville Business Magazine, Columbia Business Monthly and Charleston Business Magazine. To participate, go to www.topworkplaces.com/southcarolina or call (864) 501-9699.